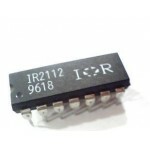 Buy online IR2130 3-Phase Bridge Driver in India at low price from DNA Technology, Nashik. The IR2130/IR2132(J)(S) is a high voltage, high speed power MOSFET and IGBT driver with three independent high and low side referenced output channels. Proprietary HVIC technology enables ruggedized monolithic construction. Logic inputs are compatible with CMOS or LSTTL outputs, down to 2.5V logic. A ground-referenced operational amplifier provides analog feedback of bridge current via an external current sense resistor. A current trip function which terminates all six outputs is also derived from this resistor. An open drain FAULT signal indicates if an over-current or under voltage shutdown has occurred. The IR2130 output drivers feature a high pulse current buffer stage designed for minimum driver cross-conduction. Propagation delays are matched to simplify use at high frequencies. The floating channels can be used to drive N-channel power MOSFETs or IGBTs in the high side configuration which operate up to 600 volts. IRF530 Power MOSFETIRF530 is a third generation Power MOSFETs and they provide the designer wit..
IR2112 High and Low Side DriverThe IR2112(S) is a high voltage, high speed power MOSFET and IGBT dri..